Specially created to eliminate stubborn fat deposits from undesirable spots like love handles, flabby upper arms and thighs, this non-invasive technology incorporates proven techniques of ultrasound fat breaking and Marie France Bodyline’s signature Fat Mobilisation System (FMS) body wrap concept. *Treatment received on my back thighs. It was certainly a pleasant and relaxing experience. The service staff and therapists were friendly and always carry a smile with them. During the entire process, I was well informed by the therapist every step she was going to proceed as well as the duration of each procedure beforehand. I liked it this way, so that you would not be caught in surprise for what they are doing on you, especially if you are first time there. Usual Price: The Intelect Spot Shaping Treatment is available at all Marie France Bodyline outlets in Singapore at S$360 per session. Yes, this is the new body wrap therapy just launched in Singapore. My treatment areas were the tummy and thighs. Body wrap treatment is usually what people hates as it deems a long boring wait, lying down on the bed in the treatment room and do nothing, but a wait (or a nap). However, this CSBS body wrap turns out to be one of my favourite treatment. I never ‘waited’. They actually transferred me to another cozy room with a comfortable sofa seat. During the process, I just had to sit down, enjoyed my magazine and drinks while treated in the wrap on my lower body. In the end, I thought 25 minutes was a little too short! Usual Price:The new Contour Sculpt Body System is available at all Marie France Bodyline outlets in Singapore at $128 per session. By and large, both treatments were simple and enjoyable. I could feel my skin on the treated areas was smoother and more supple right away. Lost of inches? Hee Hee.. Perhaps I could tell you with more confidence after a few more sessions! Oh well, at least I felt the instant toned-up of my tummy and thighs, that was for sure. 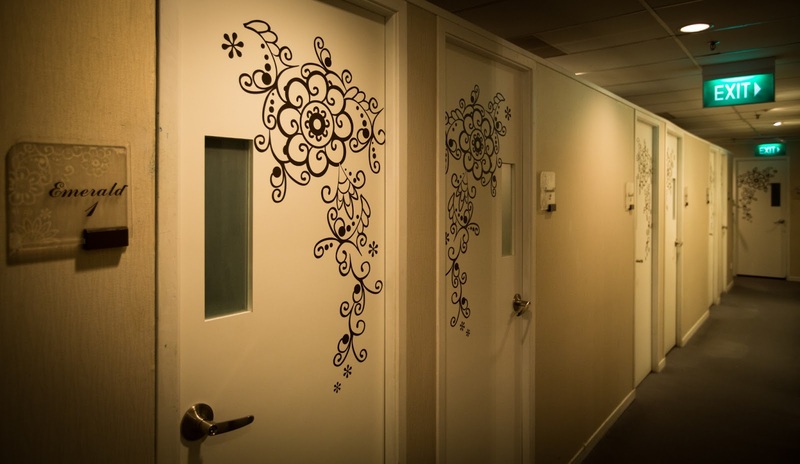 The interior designing concept of their slimming centres is classy and very inviting. It makes me feel welcome and at ease even it was my first time there. Cozy treatment room with its deem lighting. The room was neither too chilly nor too hot. Their service crew or therapist would always ask if I was comfortable during the treatment. If you are interested in these slimming programs, too, don’t worry about the listed off-the-rack prices. 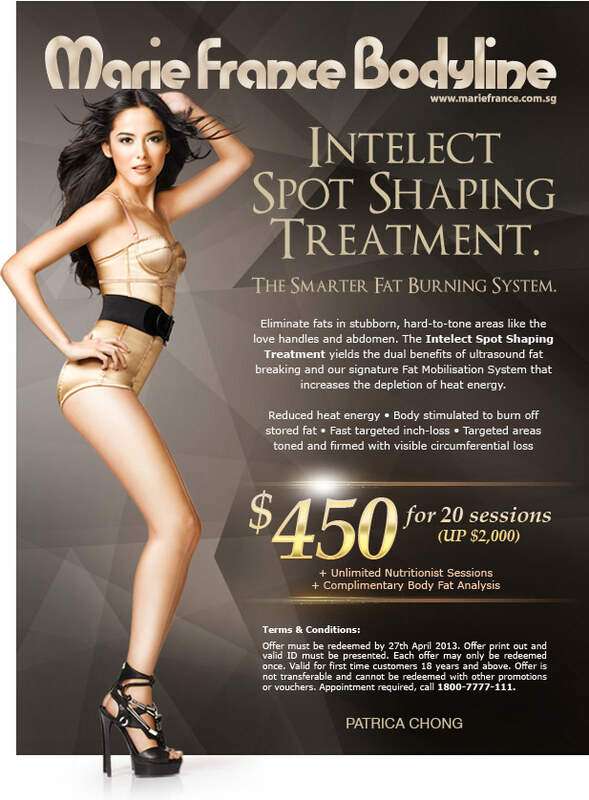 MF is offering my readers with two heavily discounted packages on their Intelect Spot Shaping Treatment and Contour Sculpt Body Wrap Treatment Protocol, from now till 27 April 2013. Complementary initial consultation and body fat analysis as well as unlimited nutritionist consultation sessionsare included. If you’re already thinking of taking up some slimming treatments, but not sure which one to go with, I think these offers are really a steal for you. 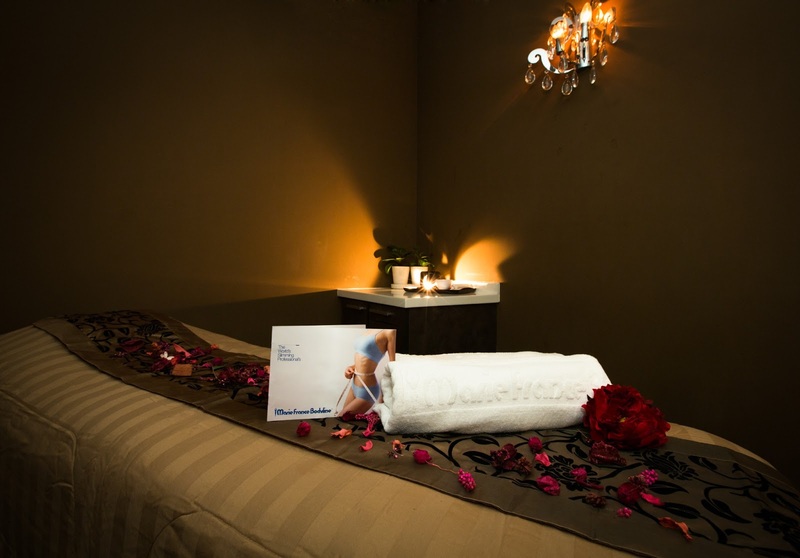 What’s more, treatments from the renowned slimming centre, Marie France Bodyline, good isn’t? Simply print out the e-vouchers here, or log in to my Face Book Fan Club to print from there. Note: The printed vouchers need to be presented before treatment and must be redeemed by 27 April 2013. Payment for vouchers must be made at the centre before treatment sessions begin. In any case, if you feel displeasure during the treatment, please direct your concern to Marie France Bodyline. Hi! I would just like to ask if you continued breastfeeding during your treatments? If so, how did it affect your baby? I am thinking of trying it out but I am still breastfeeding my 2 year old daughter though she is on formula, too. I am just wondering if it really is safe while breastfeeding. Thank you so much! Hi, I was on full breastfeeding my baby during the treatment trial as I was advised that it’s safe. Hence, I still continued after treatment. Nothing affect that noticeable to me.